Every culture seams to have a dumpling of sorts. My paternal Grandmother was from Ukrainian descent. 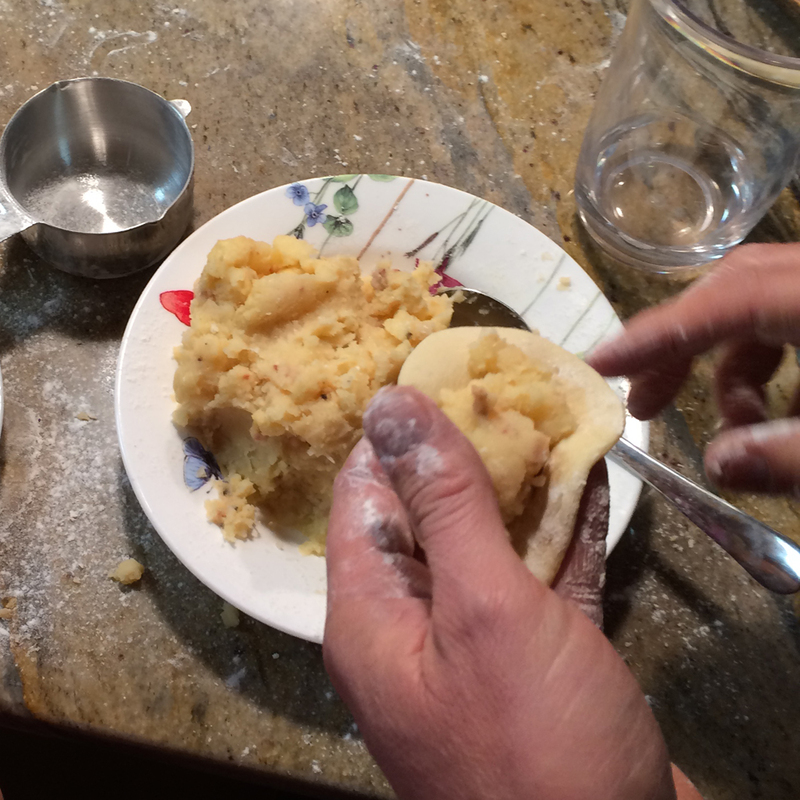 The unleavened dough wrapped around a potato filling we ate is called pierogi, (вареники). Although we also called it something else when I was young, but I can’t seem to find the spelling or meaning of the other name. Maybe something that was adapted as the family settled in Canada. 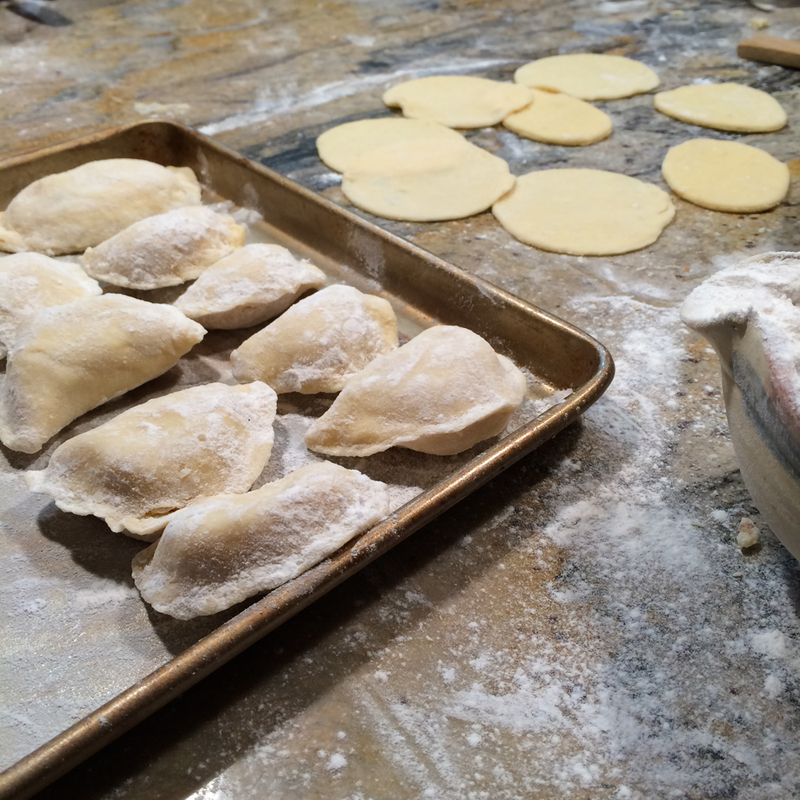 In any case, making the pierogi’s is a big deal, because we make a huge batch. It is not uncommon to process 15 pounds of potatoes. That makes 12 to 14 dozen, which is a good feed for the people it takes to make them, with a nice amount in the freezer. If many hands are at the ready, the process is pretty quick. The filing is made earlier in the day. Basically mashed potatoes with cheese, bacon and onions. Then the dough is made and let to rest for a bit. The glass for cutting the circles is ceremoniously selected. Since we had not made them in this particular kitchen before. Or you might forget which glass was used from the last time. 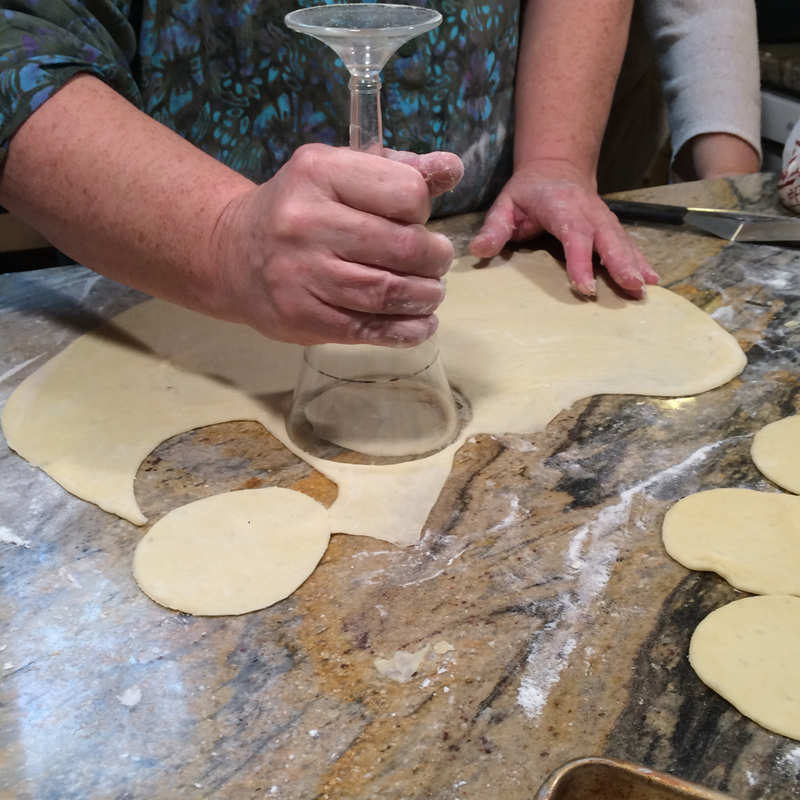 Spoon potatoes onto the circle and stretch the dough out and around the filling, leaving a ring around the outer edge. Bring the ring together in a half moon shape. Pinch the edges carefully. Then cover the whole thing in floor and pinch the edges again. Place onto a flour lined cookie sheet. Then place in a boiling pot of water. Once the float back to the surface, they are cooked. Pour melted butter over the cooked dumplings. Then back onto a cookie sheet for cooling down and freezing. Or into a frying pan with more butter and onions. Brown on each side and serve. 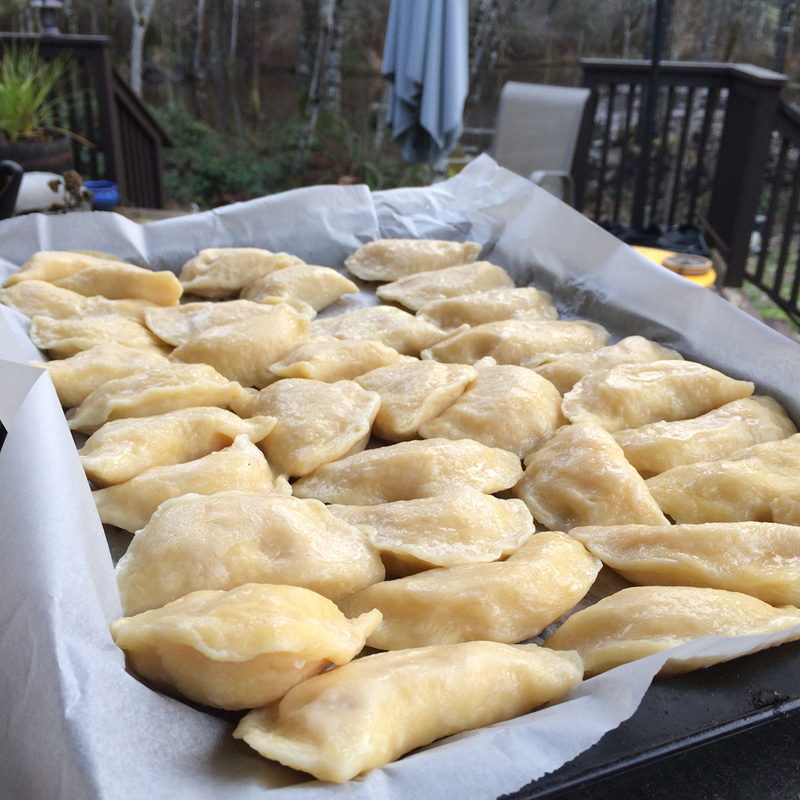 In February, on Vancouver Island, it is not cold enough to pre-freeze the pierogi. We used to make these in Alberta when it is -20 degrees C, they start to freeze quite quickly at that temperature. We made it work. When our dinner guests arrived, the kitchen windows were all fogged up, (it was a big kitchen). 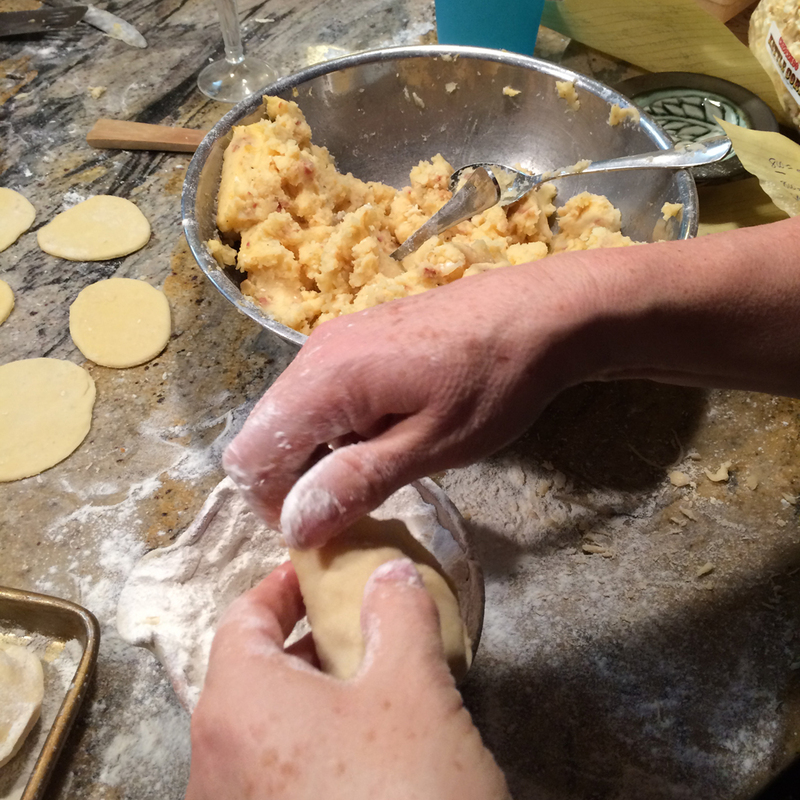 That was always another sign that a big batch of pierogis were at hand. It is not a light meal, it is a celebration. 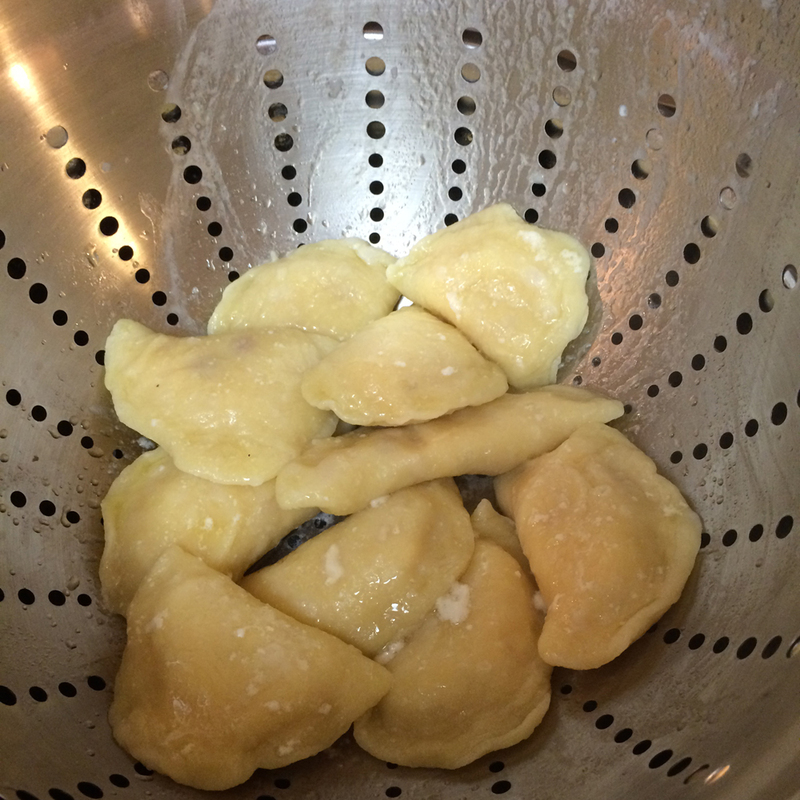 Particularly if you loose count of how many pierogi’s you ate…. ← Is work your life? The Ukrainian word is pyrohy. You roll the r somehow. Perogie is German or Polish, I believe. But all the same thing. They were yummy, weren’t they?! Especially the blueberry ones! That was a first for me. Yeah, Hailey!